In late 2016, the U.S. Federal Reserve began gradually increasing its federal funds rate; the Bank of Canada followed suit and has increased its policy interest rate by 1% since July 2017. During the same period, many people were surprised to see that their bond funds declined slightly in value. Why would an investment considered to be so safe lose value when interest rates start to rise? The decision to invest in bonds, often through a mutual fund, generally reflects the desire to protect wealth and generate income. A bond is basically a debt that a government or corporation is committed to repaying at a specific time and with a specific interest rate. Bonds are thus deemed to be a more predictable investment than stocks. For this reason, it’s not unusual to see investors increase the proportion of bonds in their portfolios when it becomes important to have some degree of income certainty – at retirement, for instance (even though sacrificing higher potential returns). This is the possibility that the issuer will not be able to repay the debt; this risk is almost nonexistent in the case of Canadian or U.S. government bonds, but real when it comes to issuers that are less financially secure. It is this risk that has materialized to varying degrees in the past two years. 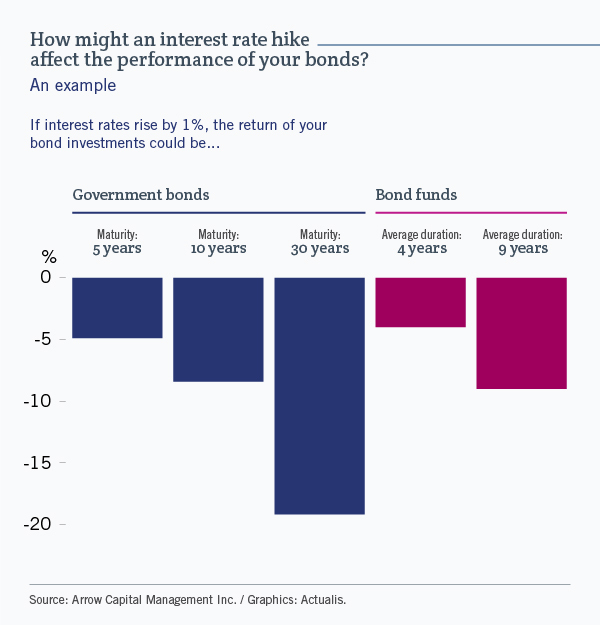 As we can see from the graphic below, there is an inverse relationship between the value of an existing bond and interest rates. Imagine, for example, that three years ago you bought a bond bearing interest at 1%. Following a rate hike, new bonds are now being issued with a rate of 3%. Obviously, no other investor would want to buy your bond, except at a discount. This is why we may see a fund made up of bonds lose value when interest rates rise. Generally speaking, the longer a bond’s term to maturity, the more its value will be affected by a change in interest rates. Fortunately, bond fund managers make a point of spreading their portfolios over a range of maturities, which gives them room to purchase bonds with higher yields as older ones mature. In the meantime, though, there might be periods when their returns could be very low, or even negative. Higher interest rates mean that consumers and businesses will have to pay more to borrow, which could put the brakes on economic growth, reduce corporate profits and thus put downward pressure on share prices. In this context, many major investors could decide to move some of their money out of the stock market and into the “safe haven” of bonds, taking advantage of the new rates available. In conclusion, as interest rates rise and fall, the effects may be sometimes positive and sometimes negative. However, interest rates are only one factor among many that influence the markets. Keeping an eye on them could make it possible to anticipate and manage their impact to some extent, which is what the specialists who manage mutual funds try to do. Bank of Canada, “Policy Interest Rate, Recent Data,” 2018. Investopedia, “The advantages of bonds,” “Understanding Interest Rates, Inflation And Bonds,” “Managing interest risk,” “How to Create a Modern Fixed-Income Portfolio,” “How Do Interest Rates Affect the Stock Market?,” 2018. Trading Economics, “United States Fed Funds Rate, 1971-2018,” 2018.